After 3 years of hard work, I am proud to report that I completed my M.S. in Space Studies from the School of Aerospace Studies at the University of North Dakota (UND). The multi-disciplinary program prepares students to become leaders in space exploration and development through a wide-ranging curriculum spanning science, engineering, applications, policy, law, history, business, and management. As this post's title suggests, I can now call myself a double-master, as I previously earned a M.A. in Earth & Planetary Sciences from Washington University in St. Louis. It was summer of 2007. Facebook was taking over the world. The Simpsons was finally available in movie form. NASA's MESSENGER spacecraft had just made its second fly-by of Venus en route to Mercury, and the Phoenix spacecraft launched toward the Martian north pole. The Peru earthquake prompted a tsunami warning while I was away on vacation in Scotland. In the midst of this backdrop, I compared several academic options with space-related distance degree programs, took the GRE exam, and enrolled in the UND Space Studies program starting in the fall 2007 semester. The "Astronaut for Hire" blog was born as a way for me to talk about my impressions as I re-connected with my space exploration passion. Just weeks after school had begun, NASA announced it was looking for astronauts, and my blog quickly found its voice. I did my best to serve the astronaut hopeful community as a source of information in an environment in which information from NASA was sorely lacking. That is still the main purpose of this blog today. By November, Japan's KAGUYA spacecraft was returning stunning HD video from the Moon (also in 2008 and 2009), and my son was born. In the span of three months, I had gone from being just a mild-mannered geophysicist protecting 2/3 of the world from tsunamis to a blogger + part-time student + astronaut applicant + father. I had to give up running marathons in lieu of shorter distances because there was no time to train. The tone for the next three years was set, and the theme was multi-tasking. A full-night's sleep became a fuzzy distant memory. Taking only one class per term, I managed pretty well for the first year in the UND program, and by June 2008 I had submitted my astronaut application. In September 2008, I wrote a popular post on the astronaut selection timeline and later found out that I had made it to the "Highly Qualified" round of the selection process. Feeling confident, I decided to up the ante by taking two courses in the fall 2008 semester. In hindsight, that was a big mistake. Not only did I double my course load with two writing-intensive classes, my wife returned to work during this period, requiring me to stay home full time 2-3 days per week with our son. Plus, the housing market came crashing down, wiping out nearly half the value on our home almost overnight and raising stress levels even higher. All of this together meant something had to give, so I ended up taking an incomplete in one of my courses and had to re-take it when it was offered again two years later during the fall 2010 semester. Despite my pressure cooker life, I did manage to squeeze in a very popular December 2008 post comparing the UND and ISU Space Studies programs. As one of the few students who had participated in both programs, I felt I had a unique perspective to offer. This landed me a spot on The Space Show, where spoke about my impressions of the pro's and con's of the two programs, and I think this exposure led to the UND-ISU agreement to jointly accept credit. In spring 2009, UND expanded its program by announcing its inaugural Human Space Systems Summer Course. I would have liked to have done that course, but instead I went to Mars. 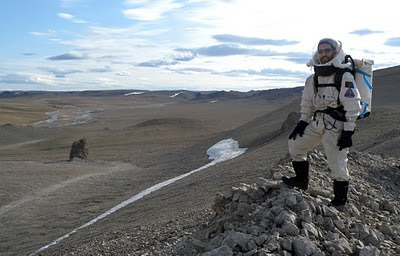 While blogging about astronaut finalist interviews, statistics, and candidate selections, I responded to the Mars Society's call for applicants to its Flashline Mars Arctic Research Station (FMARS) expedition. To my great surprise, I was selected. I honestly think the main reason I was chosen for the mission was the notoriety I had gained from this blog and by making it so far in NASA's astronaut selection. Somehow, I managed to weave together the UND requirement for an independent study research project with the month-long mock Mars mission by bringing two of my own experiments there. I blogged about the seismic and electromagnetic experiments, along with many other topics, in posts that are collected on my FMARS page. Shortly after returning to Earth, I noticed that the Mars Society was seeking applicants to serve rotations at its Mars Desert Research Station (MDRS). Of course, I applied, and they chose me to command a mission to the remote Utah outpost in late January and early February 2010. I brought another seismic experiment with me and folded it into my UND research project too. 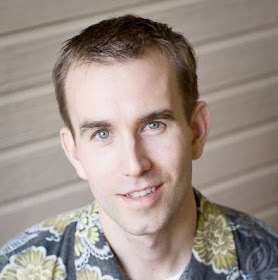 You can re-live the experience by reading my blog posts on my MDRS page. Continuing the Mars theme, UND chose human Mars exploration as the topic of the 2010 Capstone Project. My team of fellow UND students and I worked on the project for 9 months from August 2009 through May 2010 and presented the work to the Space Studies faculty on the UND campus a few days before I witnessed the STS-132 launch firsthand in a mini-reunion with MDRS crewmates. Over the past year, I have presented the FMARS-MDRS work at the AGU, LPSC, UND Symposium, and Lunar Science Form meetings. The AGU even produced a video on my work for their Younger Scientists Profiles project. Earlier this month, I finished writing up the results from my three FMARS and MDRS experiments and submitted my thesis to the Space Studies Department at UND. I am currently morphing the thesis into a book and have an offer to publish it. In addition to all of the other media attention my pursuits have garnered in the last few years, UND itself has taken note of my activities and featured me in their publications. For example, the Grand Forks Herald featured me along with other notable UND students and alumni in a space-focused center spread of local newspaper (see below). More recently, my New Scientist interview caught the attention of UND's Research News and Discovery magazine, the latter of which highlighted me in their "Spotlight on Students" section in the fall 2010 issue. The network of people I met through my two simulated Mars missions, UND studies, and this blog eventually led to the founding of Astronauts4Hire (A4H) earlier this year. Thus, I added entrepreneur to the long list of hats I wear and somehow managed to find 20+ hours of week that I could devote to building this exciting new company. A4H is a very timely venture aimed at developing the world's first commercial astronaut service. We've already been hired for our first contract to test space beer, a popular topic which understandably triggered massive worldwide media attention. To learn more, you can read interviews with me over at PARS3C and the Space Business Blog. In summary, I highly recommend the UND Masters in Space Studies. The faculty are knowledgeable and fair, and despite being located thousands of miles away, I was made to feel at home in the department from the start. The key feature that sets UND apart from its competition is the distance option, which they have continually improved over 20 years. It can be completed by anyone living anywhere in the world with only a 1-week residency requirement for the entire master's degree. The comparable space studies master's degree programs offered by ISU and ESA do not have online delivery options. The only other similar online program is Embry-Riddle's Master of Aeronautical Science with a specialty of Space Studies. See the discussion in the comments section of my Space Studies Showdown post for more. Next on my agenda is taking a few months breather from academics surrounding the birth of my second child (expected in March). I have applied to Ph.D. programs, so assuming the stars align, I may start yet another adventure in juggling school+work+life next year. Stay tuned! Thanks for sharing this in here.